Despite the unseasonably mild weather there hadn’t actually been too many great days for hillwalking recently. I would happily have foregone not having to scrape the car in the morning for some cold, crisp, still days instead of February temperatures more akin to Ankara than Arrochar and the accompanying low cloud and high winds. However, as I perused the Met Office forecast for the week ahead it seemed Wednesday, in the Cairngorms at least, was to be the exception. Still mild, but blue skies and only 10-20mph winds. Only issue was I was supposed to be working on Wednesday, fortunately I felt a slight…eh…ahem….’fever’ coming on…Mountain Fever ! No need for a ‘sickie’ though, I had carried over a fair bit of annual leave from last year’s entitlement and this looked like the perfect opportunity to call some of this in. 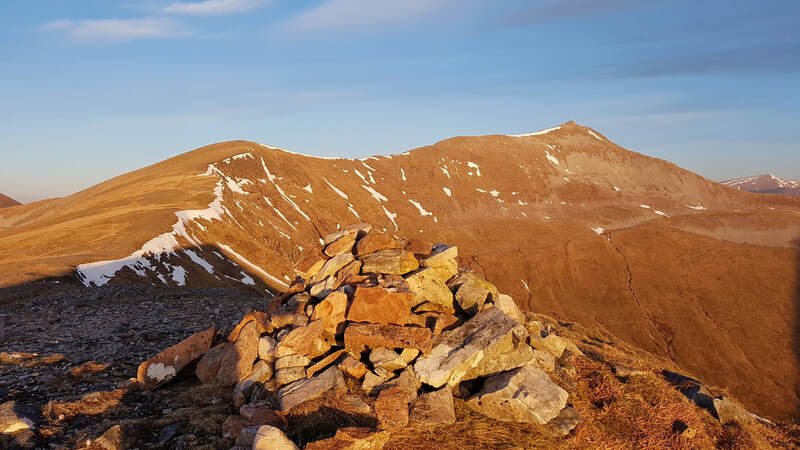 I had initially planned on heading North for a wee ‘bike n hike’ to tackle one or two of the many Cairngorms summits I still have outstanding but by Tuesday the MWIS forecast was suggesting that the whole country was likely to be bathed under blue skies. Fantastic. However, with the whole playground being open, I inadvertently found myself with the quandary of choosing where to go. As is often the case, I had to rein in my ambitions somewhat, mindful of the fact I would have to be back for the wee man getting out of school. Due to the distances and travel times involved in getting to a ‘new’ hill it was apparent that wherever I would end up heading would require another ‘stupid o clock’ start. 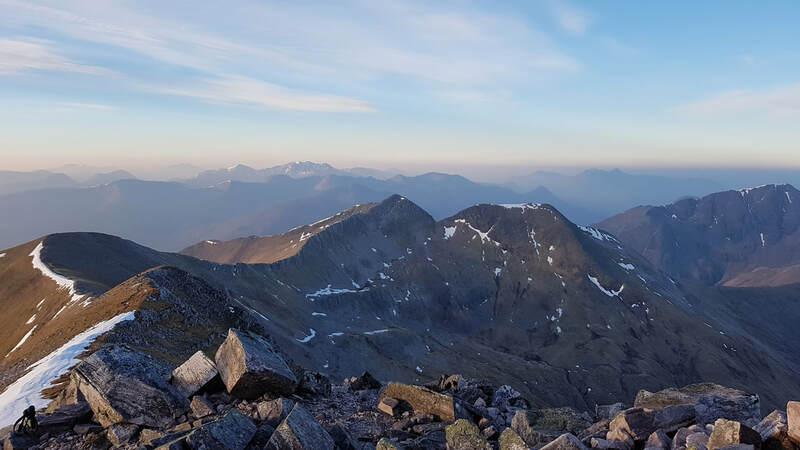 I really fancied heading back to the Mamores but most of the Walkhighlands route options were 7-9 hour estimates, coupled with a 5 hour round trip of a drive, probably pushing things even if 99% of the time I do manage round at the lower estimate or quicker. In the end I plumped for the much closer Ben Oss and Beinn Dubhcraig, from Dalrigh, despite the dreaded and much despised bog at the start of the walk. Ironically, it was ‘the bog’ that ultimately saw me have another change of heart (I used to be indecisive but now I’m not so sure ! ), and indeed saw me heading West to the Mamores after all. Turns out although I’m 43 I actually have the bladder of a 83 year old, and even the mere suggestion of caffeine after about dinner time will undoubtedly result in having to get up in the middle of the night for a pee. I headed off to bed on Tuesday night having loaded up the rucksack all ready for a quick getaway in the morning. The alarm was set for 05:30hrs but that coffee the wife ‘grudgingly’ made for me as we caught up with Sunday’s episode of ‘Baptiste’, caught up with me at 03:15 in the bloody morning !! ‘With adversity comes opportunity’…according to some fortune cookie I discovered down the back of the sofa many moons ago, and whilst in…ehh…mid-flow, I considered that I was effectively ‘up’ and could use these additional hours to get to and from Kinlochleven and still be home in time to avoid the ‘son abandoned at school gates by selfish father’ berating ! It may have been a ridiculous hour to be on the roads but the one massive plus point was I essentially had them all to myself. The only vehicles I encountered between Perth and Kinlochleven were two delivery lorries who both graciously let me pass them in true 'Smokey and the Bandit' style without so much as me having to change gear. The result was I found myself in the car park adjacent to St Paul's Church after only 1hr 45 mins. There was a chill much more reminiscent of February weather we'd generally expect as I left the car and booted up and began to make my way up through the network of paths that eventually led me out to the open moorland. 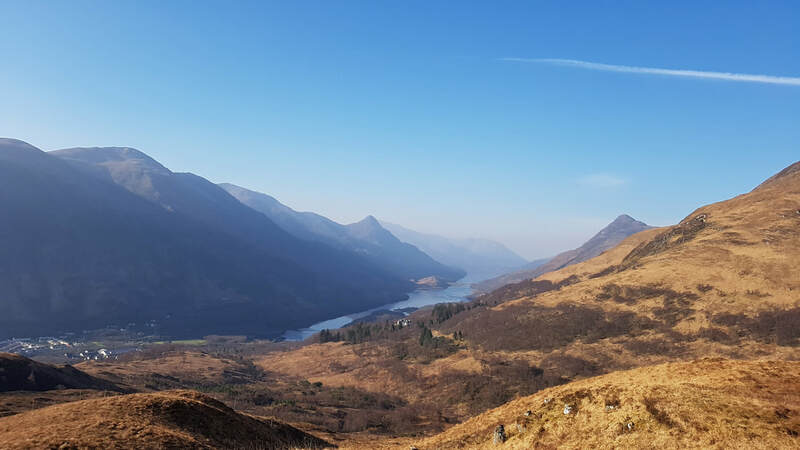 I was delighted that I had taken a screenshot of the Walkhighlands walk description as the opening few hundred metres involved numerous changes of direction to stay on the correct path. There was supposed to be an old zig-zagging stalkers path, which according to the description had been 'short-cutted' by a number of more direct routes. As I tentatively made my way through the pitch black forest I was basically confronted with a myriad of eroded paths, heading off in all directions. By the light of my head torch the original path was indistinguishable amongst the 'spaghetti junction' and jumping from path to path to try and stay on the general bearing towards the moor was really getting to be pasta joke. Soon the Penne dropped that whatever path you followed they eventually all seemed to end up joining up again further up the glen, something I'm sure would've been much more obvious in daylight. 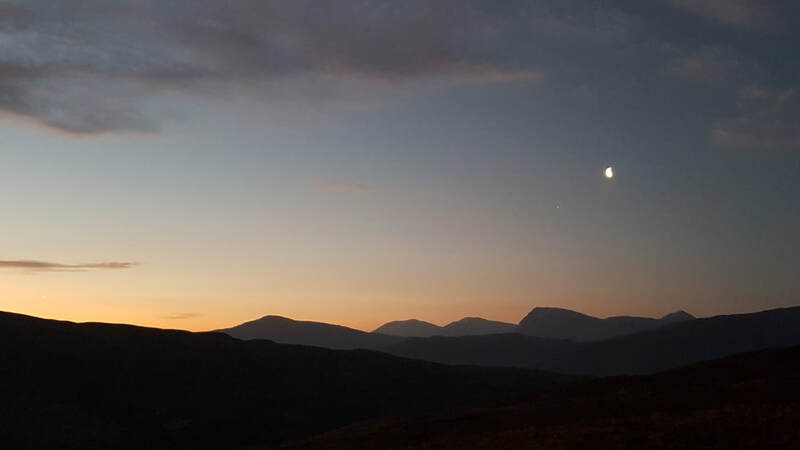 As it was all by myself, it was actually quite eerie and Cannelloni as I endured the initial trials and tribulations of navigating through the forest, however, these were soon forgotten as upon clearing the trees I was greeted with the fantastic sight of dawn creeping in over Glencoe. Behind me the much anticipated view back down Loch Leven was still in darkness and would have to wait for my return. 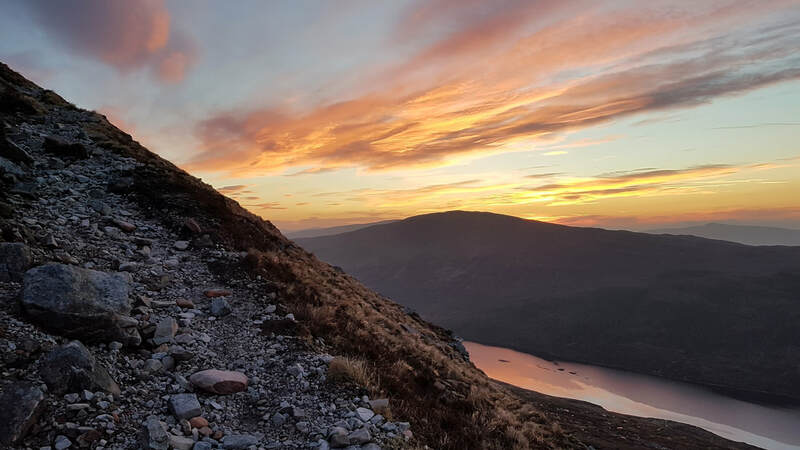 The path across the moor is well defined, if muddy in places, and soon leads you towards Loch Eilde before climbing around the southern flank of Sgurr Eilde Beag, marking the start of your ascent proper. The path climbs diagonally to the left before it turns to scree and becomes rocky and loose underfoot as it begins zig-zagging in an attempt to lessen the gradient up an otherwise extremely steep slope. It was on this zig-zag section that I almost met my untimely demise in a quite extraordinary fashion. I can only guess that as a result of the path and the wind that the ptarmigan I was about to disturb, did not hear my approach as I turned through another 90 degrees. The silence we were both enjoying prior to this moment was suddenly shattered by their distinctive warning cries and me screaming, quite frankly, like a hoard of terrified little girls, panicked by my sudden arrival they frantically tried to take flight. One of the evacuating birds was either very disorientated, or perhaps just an evil wee b&$@#! * as it ended up flying straight towards me and within inches of my face. Somewhat startled, I instinctively arched my back and face away from the incoming threat, of course this threw me off balance and it was only some comedic and very frenetic, 'arm windmilling' that prevented me from falling off the mountain and landing at the bottom with a delayed puff of white smoke ala Wile E coyote !! Of all the ways you could potentially die on a mountain that would have to be up there with the most embarassing....well not for me I guess, considering I'd be 'brown bread' and blissfully oblivious ! After taking a minute or so to compose myself after my encounter with one of the highland's most terrifying birds of prey (if ever there was a need for an 'embarassed face' emoji it is here lol) I regained my composure safe in the knowledge that I had in fact not, despite a genuine concern, soiled my new and rather dapper, if I say so myself, Rab walking breeks. Shortly afterwards I was again left stunned, this time by the astounding view before me rather than any near death experience. As I continued to climb, head down, on the relentless slopes I hadn’t noticed that the adjacent Munro of Sgurr Eilde Mor and its funky shaped lochan had come into view, and simply WOW, what a view it was. As the gradient lessened I had looked up and was greeted with one of the most amazing sights I had had the pleasure of in a long time. 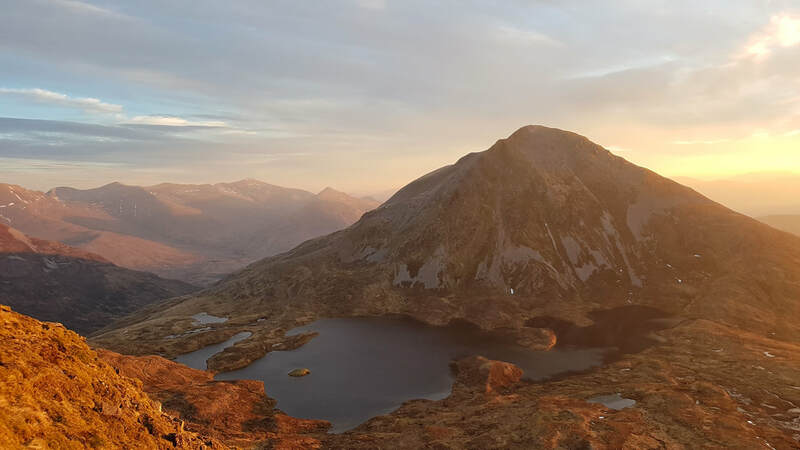 The diffused rays of the newly risen sun had created an otherworldly, orangey hue around the mountain which left it looking simply magnificent. It is not often I regret not having spent the money on, or expending the effort, of carrying a fancy big camera up the hills with me but this was definitely one of those times. I took a load of pics on the phone, desperately hoping that one of them would somehow accurately capture the scene in front of me. I realised when I got home of course, that they never do, but what I did capture was still pretty spectacular, just try and imagine it looking 10 times better in real life ! Tearing myself away from the view I carried on up the grassy slopes to the minor summit of Sgurr Eilde Beag and its cairn marking a spot height of 956m. From here the route was clearly laid out before me. 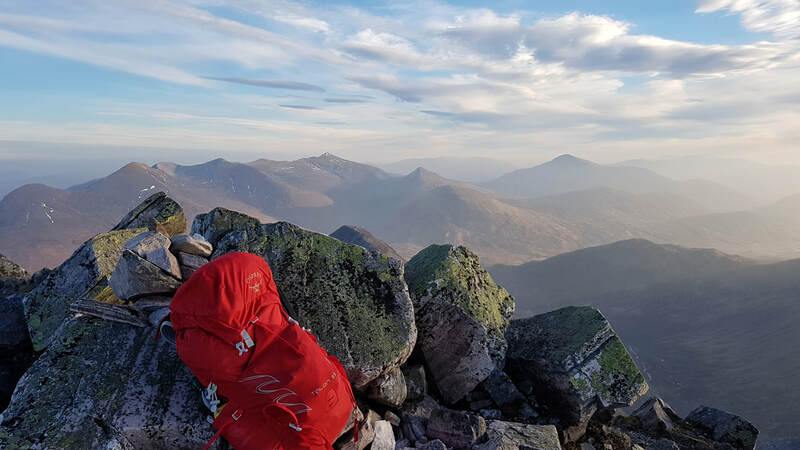 It was simply a matter of following the broad North West ridge until I reached another large cairn this time at a mighty 1062m, still no Munro bagged yet ! Not far to go though. 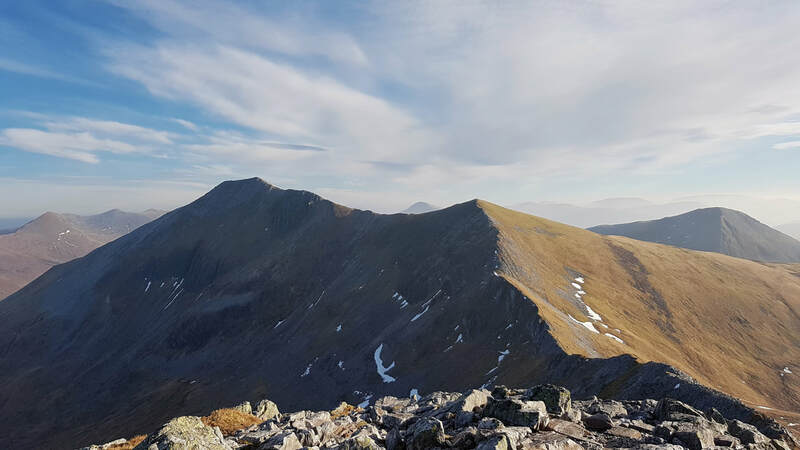 From the 1062m cairn you could very clearly see the ridges heading off to today’s two Munros. Binnein Mor to the North and Na Gruagaichean to the South West. 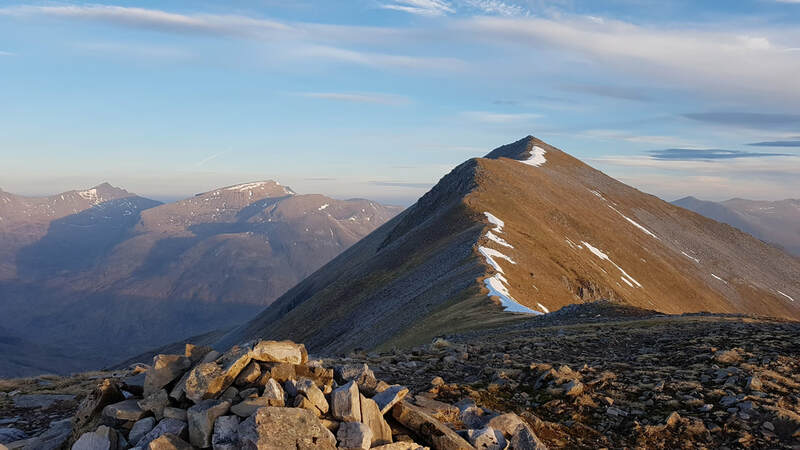 What you could also see was the first sight of Ben Nevis and the fabulous vista created by the summits of the Ring of Steall. 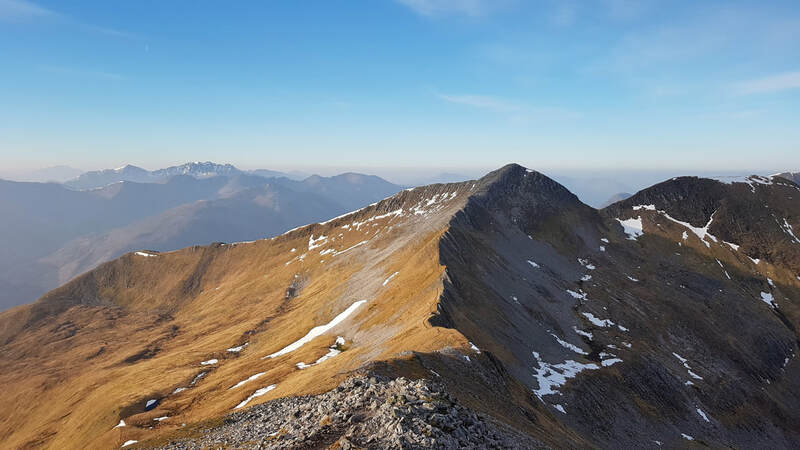 It didn’t look far to the first target of Binnein Mor, the highest summit in the Mamores. In fact, it only took 15 minutes to follow the ridge Northwards to the summit. There is a minor top on the way along with a slight drop to a bealach beyond but I hardly even noticed it such was the focus on the excellent looking short ridge walk ascending to the tiny summit. When I say tiny, I mean the area around the summit cairn not the impressive height of 1130m. As my granny would’ve said, “there was not enough room to swing a cat !”. It had taken exactly 2 and a half hours to reach this point and in this time the sun had risen into a wonderful blue sky. The views in all directions were simply breath-taking. Perhaps the most surprising was to the North where you look down on the Munro of Binnein Beag which at not much over 900m looked ridiculously small from my vantage point. I doubt that’ll be the sentiment when I have the opportunity to climb the wee fella. 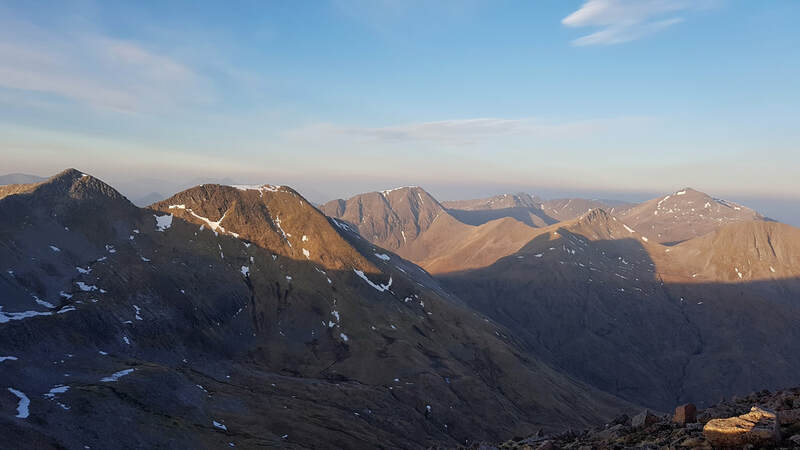 However, the stars of the show were undoubtedly the huge bulk of Big Ben to the NW and the Ring of Steall to the West. Both looked so close I felt I could shout out to anyone lucky enough to be on their summits. A preposterous notion you understand, not because of the actual distance, but more likely a case of what other nuggets would be atop a mountain at just after 8am on a Wednesday morning !! I could go on & on about the magnificent vistas but I’ll let the pictures/video do the talking, however inferior to the real thing they may be. Admiring one of the better sides of the Ben...and without doubt my best side ! Leaving the summit I retraced my steps back along the ridge to the 1062m cairn, all the while being treated to the excellent view of the second Munro of today and its connecting ridge. 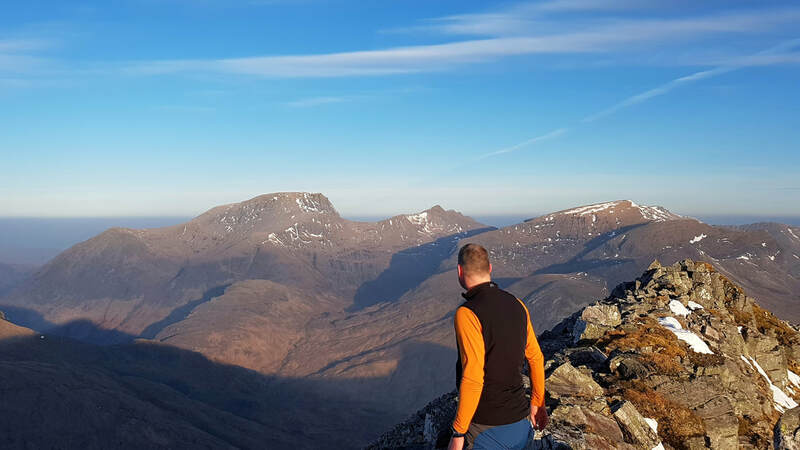 Na Gruagaichean might sound like something a Klingon would have for breakfast but there is no doubting that the view along the ridge to its summit was simply out of this world. 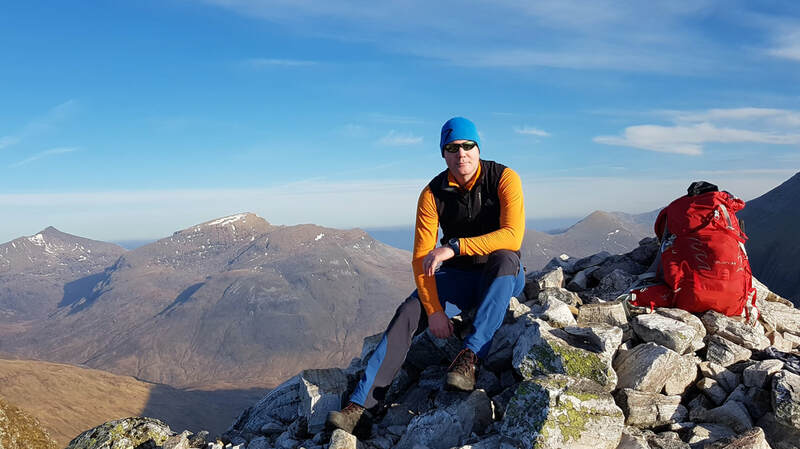 It would have taken less than 20 mins to reach the second summit if I hadn't stopped for a bite eat on the sun drenched, grassy bealach just before the final ascent to the summit. The weather was simply glorious and here out of the little wind that was blowing, the temperature were more reminiscent of August than February. I was only wearing a thin baselayer and a softshell gilet and to be honest a t-shirt would've been a better option, incredible really. The grassy ridge makes way for a ridge of shattered rock for the final few hundred metres, the kind that are likely to snap a misplaced walking pole in an instant. At this point I should give a mention to wee Jamie from the work who answered my last minute mercy call for a loan of his walking poles. It appears that I must've left mine in Ben Vrackie's car park on the return from my most recent wander up there, either that or my garage was the victim of a very specific robbery ! Regular readers will know that having to splash out on new poles will come as a dagger to my heart, any recommendations welcome, however, given my legendary 'tightness', please remember that unless they come from China and are spelt Lekki the premium brand is well out of my budget....and my abilities to look after them properly, history would suggest ! Not wishing to risk snapping jamie's poles I stowed them away for the last wee scrambly bit up over the rocks to the summit cairn which was reached without the need for too much ascent from the bealach. 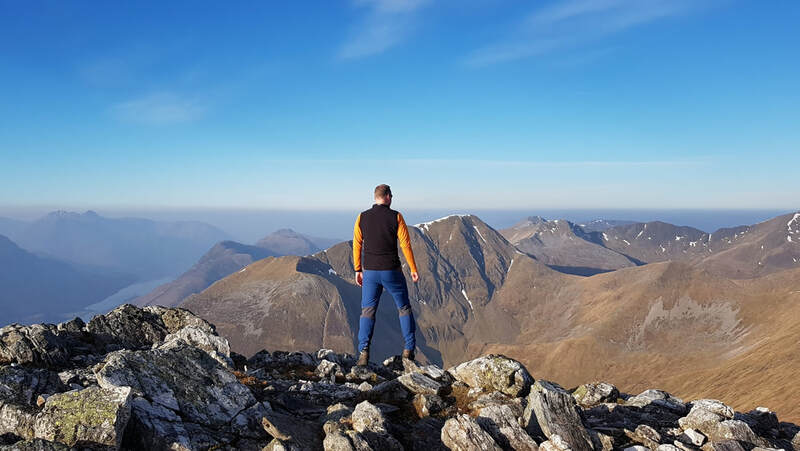 Slightly smaller at 1056m this second Munro of the day still offered fantastic views, my favourite being the vistas South to Glencoe where the only remaining snow patches were desperately clinging on to the shaded crags of the hulking Bidean nam Bian. Again the views to Nevis and over the Ring of Steall were nothing short of fabulous. It felt as though I was pitched on top of the world and at that moment I really could not think of anywhere else I'd rather have been. This really was Scotland at its finest. It was not even the length of half past nine when I took the decision that as always, all good things must come to an end, and it was time to head for home. The disappointment was somewhat lessened by the promise of spectacular views down the length of Loch Leven on my descent. Initially I headed along the South ridge before heading SW and then South again in a pretty direct route of the mountain. There was no path to follow as such and it was really just a case of picking a route down the grassy and boulder strewn slopes, quite steep in places, towards the Loch Eilde Mor track in the foot of the glen. It seemed like an eternity before I reached the track and it was with some relief that I eventually reached the gate in the deer fence, marking the beginning of a straightforward walkout towards the start point. By this point my right knee was killing me. I have long since extolled the virtues of the Kinesiology tape that was holding my left knee together and it was now irrefutable that my 'tape budget' would have to be doubled, this getting old malarkey is no fun ! I mentioned I'd been watching Baptiste at the start of this post and ironically enough I must have bared a remarkable resemblance to the French detective as my exaggerated limp propelled me slowly back towards the start point. 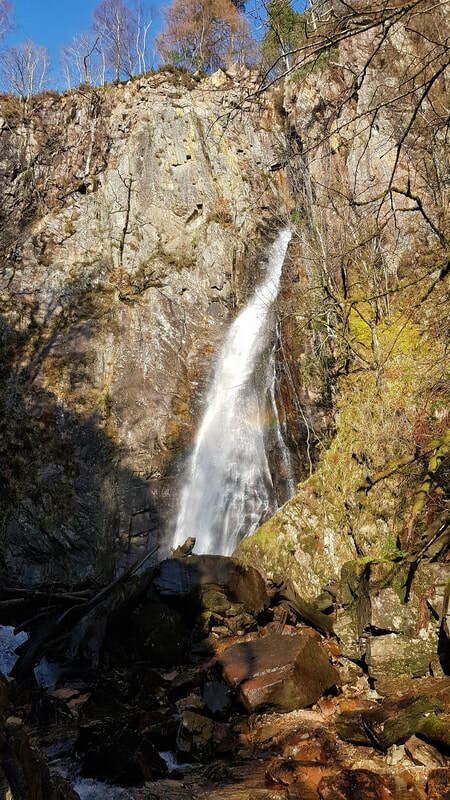 Eventually I hobbled my way to a footbridge that would return me to the correct side of the river to reach the car park, however, the thundering sound of the cascading water from the Grey mare's Tail, waterfall nearby proved irresistible and I set off down the track to find it. Turns out is is only a five minute walk to reach the gorge which has been fitted out with a few rudimental walkways (planks of wood !) allowing you to get as up close and personal as you wish. Quite an impressive sight, even if I doubt it was flowing at anywhere near full capacity given the recent dry weather. All that remained was to retrace my steps, cross the bridge and follow the path back towards the church. I quickly reached the car park and despite the assertions of my colleague who grew up in Kinlochleven (he warned me the locals would steal the sugar from my tea !!) I found my car exactly where I'd left it. 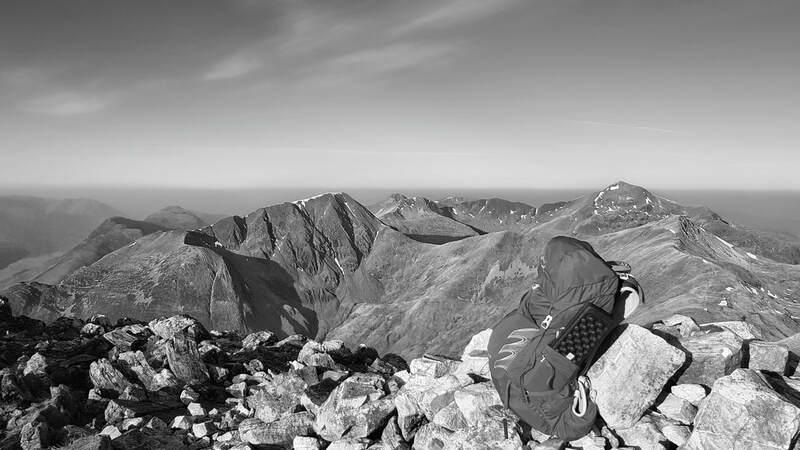 Numbers 106 & 107 bagged on a quite fabulous morning in the Mamores...prompting another colleague of mine on seeing where I'd been to proclaim that there are few things better than spending the morning nestled between a fine pair of Mamories....indeed Norman, indeed !